Scottish Rite Masonic Museum & Library: John Banvard's "Loony Speculations About Masonic Oaths"
John Banvard's "Loony Speculations About Masonic Oaths"
I found this all quite fascinating in terms of the history of American popular entertainment, but what caught my eye in terms of our library was a mention that in 1880 Banvard published a book of poetry entitled The Origin of the Building of King Solomon's Temple [RARE 63.B219 1880], with a cover title of The Tradition of the Temple. Collins remarks that the book's "epilogue descends into a miscellany of details about English church building, Egyptian obelisks, and loony speculations about Masonic oaths, a subject of apparently inexhaustible interest to the author." Shown here is our copy of Banvard's book, which I took a look at. For better or worse (and I'll admit to being a little disappointed), Banvard's interest in Masonic oaths seems neither of inexhaustible interest (it's all of one page), nor do his "loony speculations" strike me as particularly loony - especially not for the time period. What I found instead was a fairly typical point of view that seems heavily influenced by 19th-century American orientalism, something that was especially prevalent in the visual arts at the time and which would certainly overlap with Masonic rituals and symbolism which draw heavily from Biblical settings and bring to mind thoughts of an idealized, ancient Middle East. 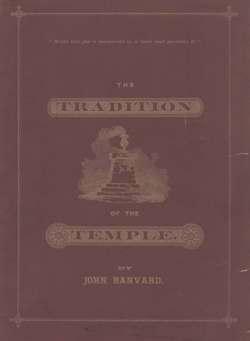 With Banvard, as with others at the time, this all dovetails especially well with a long-standing Masonic interest in Solomon's Temple, which features prominently in Masonic rituals. And good pilgrims from far go thither for prayer. That field has an emblem in every land. Banvard, John. The Origin of the Building of Solomon's Temple: An Oriental Tradition. Boston: Published by Howard Gannett, 1880. As for Paul Collins, the author of Banvard's Folly, he has his own (highly entertaining) blog, which you can check out here.